In 1966, German-born Heinz Hankammer sought to find the best way of filtering normal tap water. He named his company after his daughter, Brita, and involved his entire family in setting up the business. Hankammer got to work, developing methods of desalinating water and improving its taste. His first successful filter was the AquaDeMat, which was used to demineralize water for car batteries in Europe. Brita has grown to produce several products for supplying people with clean, healthy water, including water pitchers, faucet filters, and kettles. The quality of their products has built their reputation of being the best water filters on the market. In 1988, the Clorox Company acquired the rights to use the Brita brand name for use in North and South America. 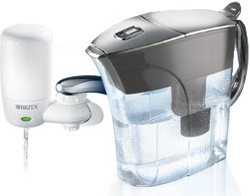 Brita's faucet-mount filter and filtered water pitcher. The company prides itself on being environmentally conscious. In 1992, Brita introduced the first program for recycling Brita water filter cartridges in Europe. Together with water bottle manufacturer, Nalgene, the company helped found Filter For Good, a program aimed toward reducing the increasing plastic waste produced by store-bought bottled water. In November 2008 Brita joined forces with Preserve to establish a filter recycling program for used Brita water pitcher filters in North America. Brita is also one of the major sponsors of "The Biggest Loser", a televised weight loss contest for the NBC network. Fun Fact: The activated carbon used in Britaâ€™s water pitcher filters come from specially heated coconuts! Brita has recently entered the market of refrigerator water filters, producing Brita water filters that are compatible with models made by Whirlpool (4396508), Maytag (UKF7003AXX), GE, MWF), and Frigidaire (WFCB).